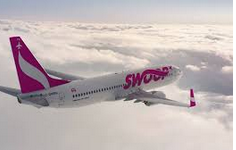 Founded in 2018, Swoop is a new ultra low cost airline based in Canada. The company opened its doors to customers in June, 2018 and is fully intent on leaving a mark on the Canadian market. Its entry into the market has revolutionized the domestic aviation industry with many operators now making plans to counter its meteoric rise. The airline makes an entry into a highly competitive industry at a time when air travel is at its peak. In relation to other developed nations, Canada has surprisingly been slow to adopt low cost models. However, it seems this North American market is ready to have its first ultra low cost carrier. Swoop has expressly stated that its prices will be up to 40% lower than the standard levels. Some of its tickets will even fall below the $100 mark. With this in mind, it needs to go further to embrace low-cost long-haul business model to enjoy even better operational efficiencies. This paper presents an analysis of business strategies for Swoop before evaluating the low-cost long-haul business model. Swoop boasts an ultra modern homogenous fleet comprising of new aircrafts. This will come in handy to provide competitive edges in relation to other operators with aging fleets. The company intends to connect the entire Canadian market and has bases across the country. It will serve major cities with a view to increasing the number of passengers opting for air travel. Contrary to expectations, Swoop will also award priority to quality service. It does not want to acquire the tag of an airline ferrying people across the Canadian skies. Rather, it wants to provide customers with thrill and experience (Siekierska, 2017). This way it hopes to attract high customer traffic to its operations. In this regard, it hires only the best talent the market has to offer. Afterward, the successful candidates receive intensive training to provide the best customer service in the market. The company also provides snacks onboard and customers are at liberty to request their favorite snack brands. 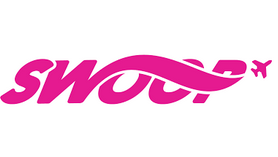 Swoop is a subsidiary of the massive Canadian airline WestJet. The mother company must have identified the attractive prospects in the low cost market and proceeded to found a new low cost carrier. This way, it would focus fully on the mainstream market whereas the subsidiary centers of the domestic low cost segment. Another unique aspect about Swoop’s operation is that it runs a homogenous fleet comprising of Boeing 737-800 (CTV News, 2018). These planes come with massive capacity and can carry up to 189 passengers. Such a strategy comes in handy to cut down the operational costs. To be specific, it will not have a sophisticated technical team to carry out repairs and maintenance on diverse aircraft models. Rather, a modest team with few experts will be sufficient to handle such tasks. 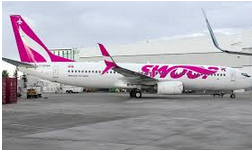 Currently, Swoop operates short flights between modest Canadian cities. This has been its strategy to gain footing in the market. By targeting small cities and airports, it seeks to build its brand equity and familiarize customers with its operations in unique routes. Most mainstream operators do not pay close attention to smaller routes. For this reason, the airline serves short routes between Edmonton, Abbotsford, Winnipeg, Halifax, and Hamilton with more coming up in its schedule soon (CTV News, 2018). The main objective is to appeal to Canadian passengers living close to the US border and who have since shifted to flying cheap US airlines operating in the vicinity. Customers can further enjoy cheaper flights by purchasing one way tickets which come at greatly reduced prices. It turns out that it could increase financial performance with a low-cost long-haul model. This is in relation to the prevailing trends in the market which every airline has made efforts to embrace. The next section presents a SWOT Analysis of Swoop with a view to analyzing its marketing strategy. The company charges some of the lowest fares in the entire airline industry. This low cost strategy ensures that it remains operational in the highly competitive industry where each operator is always trying to appeal to the next customer. With the low prices, the company has gained an increasing level of market shares. The customers find the company’s offerings very affordable and keep preferring its services from a wide presentation (DIACONU, 2012). Furthermore, its low fares also contribute towards a high traffic volume for customers seeking to enjoy its cheap flights. This also implies that the company enjoys a high turnover rate keeping in mind that it experiences vibrant operations. The company only has to keep its operational costs at the bare minimal to enjoy high profitability. In addition, it boasts some of the latest aircraft model. As a new operator, its homogenous fleet comprises of brand new Boeing 737-800 aircrafts (CTV News, 2018). It boasts one of the most modernized fleets in the market. This implies that it also enjoys the economy that comes with superior fleets in relation to competitors. What is more, the company has also made efforts to develop quality services. It now ranks as the best airline in the low cost market in relation to the quality of its services coupled with friendly staff to top it up. Whereas the low prices appeal to numerous customers, it does not help the fact that it constitutes a low contribution margin. At the same traffic volume, a different operator will record higher profitability. It only implies that the low prices stand in the way of the company‘s progression. In addition, the company does not yet possess high brand equity (ABDULLAH and TAKAHASHI, 2015). As anew operator, not many customers are familiar with its brand to the extent that it can influence the decision making process. The company has to make additional efforts to ensure it develops its brand through aggressive marketing. The low prices associated with the company are bait for attracting customers. Customer tend to frequent airlines charging low prices keeping in mind that a majority are cash strapped and do not possess high disposable incomes. Therefore, the low fares enable them to balance their tight budgets unlike other offerings (HUETTINGER, 2006). With the low fares, the company has appealed to various players within the international market scene. Currently, it has a loyal customer base which contributes its annual performance. The company seems to have clicked with the international customer base which seeks quality and economical services to fit into their tight budgets. Recently, it has become apparent in the airline industry that the secret to attracting customers rests in charging low fares. This has prompted a high influx of airlines into the industry with a similar strategy. It would be almost impossible for the company to maintain its market grip owing to the increasing level of competition. This heightened level of competition makes it difficult for the company to maintain its current level of operations. In addition, the increasing market entries of similar operators only imply that it will lose market shares to accommodate the efficient services of such operators. The company has to keep up the campaign to retain its dominant market position and the only way to do so would be to run differentiated services (ABDULLAH and TAKAHASHI, 2015). 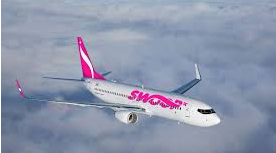 In addition, Swoop could trigger intense rivalry with American low cost carriers if it ever expands beyond the Canadian market. As mentioned, the low cost segment in Canada is still at the formative stage and cannot measure up to the highly advanced US sector. Chances of heightened level of competition from American airlines remain very high. The company has made efforts towards informing the customers about its existence in the market. It has made deliberate efforts to ensure that all potential customers become aware of its quality services with a view to influencing their decision making process. It duly understands that it is almost impossible to record higher performance in the absence of increased market awareness levels (DIACONU, 2012). The customers must be fully aware of the operations and offerings associated with the company. This way they tend to prefer its services when presented with wide options in the market. The marketing strategy also exhibits a matrix structure. It relies on both the traditional an online media in efforts to reach out to the customers. The traditional media has been very effective in reaching out to the entire market in the sense that it broadcasts its messages. Customers have the opportunity to view its adverts from the comfort of their homes. This way, the company has acquired an increasing level of market visibility (BADICU and STATE, 2016). Its brand name alone is sufficient to trigger massive demand in the market. This is how the marketing strategy on the traditional media platform has increased performance for the organization. In addition, the company also runs adverts on the online media platform. This is in relation to the increasing proliferation of the internet as a critical marketing platform. One thing for sure is that the online platform presents the best option to receive feedback from the customers. The virtual platform assures marketers to receive feedback from the customers in real time. Unlike the traditional media, the virtual counterpart comes with options for customers to also respond (MARTIN, FEILS, and ALLEN, 2005). Normally, the traditional media platform only accommodates one way communication. However, the online platform makes it possible for organizations and customers to interact on a daily basis. This way it becomes much simpler to understand the target market segment and how to develop suitable options. The marketing strategy at the company is also very effective in the sense that it focuses on the company’s strength. A quick perusal of its strategy reveals that it is always keen on informing the customers about its competitive advantages. For instance, it touts itself as the best low cost operator in the market with affordable prices. This way, even the most evasive consumer will be aware of the fact that it charges low prices (HUETTINGER, 2014). Such a marketing strategy is very well calculated to increase the market penetration levels. What is more, it increases the chances of acquiring additional market shares for the company in the future. On the downside, the company has not fully capitalized on the opportunity to increase market traction. It needs to adopt a marketing gimmick. Currently it is only reliant upon a marketing tag line which might go a long way to cement its message within the market. For instance, it might opt to go with a gimmick revolving around having the lowest air fares in the market (DIACONU, 2012). Similarly this could also consider options to include complementing budgetary decisions for the customers. A marketing gimmick goes a long way to ensure that a company’s marketing message reverberates with the customer base. The airline has revolutionized the Canadian aviation industry and has attractive prospects. Its new model is a competitive edge and will come in handy when competing for customers. Previously, airlines were intent on making high marginal profits, which pushed the fares in the market to an all time high. However, with the emergence of low cost operators it has become very cheap for customers to fly to various exotic destinations. Even those that previously preferred to travel by cheaper means, especially road transport now find the air fares to be within reach (DEEPA and JAYARAMAN, 2017). This company has done a thorough customer profiling to understand the needs of each and every individual seeking to enjoy the services of an airline company. In this regard, it understands the needs of all of its customers and stands to record even higher performance levels in the coming days. A decision to invest in the company would be well informed. This airline stands the chances to be amongst the best operators in the near future. The best decision ever would be long term investments in this rapidly evolving organization. In fact an investment decision centered on capital gain would be the best since the airline can only get better and better with time. Currently, the company is listed on the stock market and is accessible by simply purchasing shares. Prospective investors must treat the company as a long term strategy to increase their financial position. The low-cost long-haul strategy stands as one of the ways to guarantee the better financial performance in the future. It simply refers to cheap flights to far flung destinations. Recently the air industry has witnessed an increased proliferation of high capacity aircraft. With specific reference to Boeing 737-800, the air industry now boasts high capacity aircrafts that can fly for long distances(VILLARD, 2013).. What is more, the product development processes for such plane awarded priority to efficiency such that the resultant planes consume less fuel and can fly much longer. This has increased the viability of the low-cost long-haul model since companies can decrease their marginal costs yet still realize higher profit margins while charging low fares. 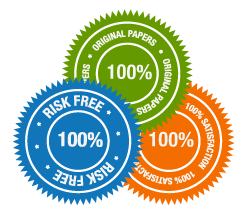 Sustainability ranks among the main concepts constituting the subject of debates in the corporate world. For a long time, the corporate world has long engaged in profit maximization at all costs. Sometimes, such a stance does not guarantee future survival of a business. The best model would be one seeking to guarantee future of a business even as it struggle to remain afloat in the tumultuous business world. This is what the low-cost long-haul model guarantees for a firm. It ensures that the airline remains operational in the highly volatile international (FLOURIS et al, 2009). The issue with the international air travel is that it is very risky. New airlines keep emerging in the field which implies that the competition gets stiffer by the day. Amidst all this, customers are always seeking cheaper options to consume. This might not be true for every customer but at least the majority. Therefore, the market will always present ready demand for low cost options. This factor alone makes the business model attractive and the easiest way to guarantee future survival. Air travels features in the consumer’s list of wishes. Some customers just want to travel by air to enjoy the thrill of being airborne. Sadly, not many achieve such ambitions due to the exorbitant prices charged for air tickets. It has become almost impossible for low income consumers to travel by air (VILLARD, 2013). As a result, airlines are losing more and more customers especially those charging high ticket prices. In the 21st century air travel should not be feature among the consumer’s ambitions. This innovation is over one century old and by now ought to be a normal activity like travelling by road. Therefore, the decision to charge low prices will appeal to many consumers. In fact, some will travel by air simply to enjoy this experience. The low-cost long-haul model stands as the surest way to attract high consumer traffic to an airline. The critical aspect about model is that it will deliver high passenger volumes for the airline. On the contrary, some would argue that the model is not sustainable since it trims the profit margin for an airline. By charging low prices, an airline realizes low marginal profits and cannot compete effectively. What is more, it will also lack sufficient working capital or resources to channel towards the acquisition of critical assets. Whereas there are elements of truth in this school of thought, it does not help the fact that the low cost model attracts high passenger volumes. In this regard, these numbers alone makes up for the low prices (FLOURIS and WALKER, 2007). In the end, a company records higher profitability through lower prices by the simple fact it increases sales volume. Finally, the sustainability of this model also stems from the resultant economies of scale. With massive operations, an organization enjoys the opportunity to trim the marginal costs to the bare minimum. But this only comes as a result of running large scale operations. In the airline industry, large scale operations are only possible with giving quality service while charging low prices. This way, customers flock towards the cheap services with a view to minimizing their travel expenditure (MARTIN, FEILS, and ALLEN, 2005). The sustainability in this regard stems from higher profit margins. The low operational costs enable the airline operators to achieve greater profitability even with a stagnant passenger volume. Perhaps the most appealing aspect about this model is that it increases the chances of survival an economic downturn. With low prices, an airline will appeal mainly to the low and middle income customers. In the event of an economic downturn, it is this category of consumers that gets impacted the most. Therefore such customers will want to prefer cheaper options more than ever before. Even their rich and high income counterparts will experience drastic changes in their financial positions. To this consumer segment, they will have their disposable incomes reduced as was the case in 2008 global recession and financial crisis (VILLARD, 2013). This consumer segment will now have to embrace frugality by revising their spending habits downwards in the entire duration of a downturn. What this implies is that operators in the economy with lowly priced options will thrive against the backdrop of a biting recession. Demand will increase and it is during such tumultuous periods that such low cost operators can increase market shares at the expense of premium counterparts. The entire business model revolves around economies of scale through increased passenger volumes. At the height of an economic downturn, consumers tend to cut back on non essential expenditure in a bid to see out the catastrophe. Therefore, a low cost airline will experience increased demand from unusual quarters when high income consumers flock towards economical options. This will provide a lifeline to the low cost carriers which rely upon competitive price as a strategy to attract high numbers of passengers. The prices will be low enough to fit in the tight budgets of customers in a recession (DACHIS, 2014). This is to demonstrate that the low-cost long-haul model is a viable option in times of economic stability and crises. Swoop should not waste any more time deliberating on this move. It needs to move with speed to implement this model before another operator. This way it will acquire first mover advantage which presents a competitive edge in the market. The airline needs to differentiate its services from the rest. The low prices should not be an excuse to offer low customer service. At any given time, its customers should identify its brand with quality services. This is the only way to stay ahead of the pack. It will be next to impossible to launch low-cost long-haul services with its current narrow field of operations. The company might have to consider expanding into the international market to enjoy better economies of scale from extended flights. With only two months in the market, Swoop will have to do a lot to familiarize the customers with its business operations. It needs to mount an aggressive marketing campaign to increase brand equity. Social media marketing should receive top priority due to its effectiveness and economical aspects. From the above discussion, it has become apparent that the low-cost long-haul model is not sustainable during economic turmoil. This implies that the airline might get impacted heavily with possible market malfunctions. This is why it is critical to diversify to cushion its operations from such possibility. Swoop should divert some of its earning in a non related industry to guarantee better financial performance. ABDULLAH, D. and TAKAHASHI, H., 2015. To Maximize the Profit of Low Cost Carriers Aviation in Pakistan by Unified Aircraft Operation Policy. Journal of Business Strategies, 9(2), pp. 59-81. BADICU, G.D. and STATE, V., 2016. Low-Cost Aerial Transport in Europe. Valahian Journal of Economic Studies, 7(2), pp. 1-10. DACHIS, B., 2014. Full Throttle: Reforming Canada’s Aviation Policy. Commentary – C.D.Howe Institute, (398), pp. 0_1,0_2,1-24. DEEPA, M.V. and JAYARAMAN, K., 2017. Scale Measurements for Airline Service Quality to Secure Passenger Confidence in Air Travel. The Quality Management Journal, 24(3), pp. 31-53,4-5. DIACONU (MAXIM), L., 2012. The Evolution of the Low-Cost Airlines Between 2000 and 2011. Comparative Analysis Across American and European Low-Cost Operators. Universitatii Bucuresti.Analele.Seria Stiinte Economice si Administrative, 6, pp. 115-128. FLOURIS, T. and WALKER, T., 2007. FINANCIAL COMPARISONS ACROSS DIFFERENT BUSINESS MODELS IN THE CANADIAN AIRLINE INDUSTRY. Journal of Air Transportation, 12(1), pp. 25-52. FLOURIS, T., HAYES, P., PUKTHUANTHONG-LE, K., THIENGTHAM, D. and WALKER, T., 2009. RECENT DEVELOPMENTS IN THE AVIATION INSURANCE INDUSTRY. Risk Management and Insurance Review, 12(2), pp. 227-249. HUETTINGER, M., 2006. Air Baltic and SAS – a case study in the European airline industry. Baltic Journal of Management, 1(2), pp. 227-244. HUETTINGER, M., 2014. What determines the business activities in the airline industry? A theoretical framework. Baltic Journal of Management, 9(1), pp. 71-90. MARTIN, B., FEILS, D.J. and ALLEN, G.C., 2005. A TALE OF TWO AIRLINES: WESTJET AND CANADA 3000. Journal of the International Academy for Case Studies, 11(1), pp. 97-106. VILLARD, P., 2013. Funding and administrating airport screening in Canada: A transportation policy like the others? Journal of Transportation Security, 6(2), pp. 117-129.